The following concept was written as part of a new business pitch for Central Florida McDonald’s. With competition growing fierce in the QSR and fast-casual breakfast vertical market, the Central Florida McDonald’s co-op was facing stiff opposition in the breakfast category from the likes of Dunkin Donuts and a host of others. In addition, they were gearing up for the corporate rollout of the new Southern Style Chicken Sandwich. Given the market’s climate, innovations and menu changes intended to draw in customers needed to be heavily, yet cohesively promoted—a customer needed to understand the message and relate to it in a way that was on brand. We knew consumers were willing to try new things, it just had to come with a brand essence adoption. To tackle both the growing competition in the breakfast market and the introduction of a new menu item, evok analyzed day parts, traffic flow, trends in the economy and workforce, drive times and motivational factors for the target demo, all in an effort to combine two initiatives into one. Our research showed that although sales were consistent for the day part, unit sales were actually down and the revenue was constant due to price increase. Expenses, however, were also increasing and margins were growing tighter. At least three competitive brands were rolling out new breakfast menu items and stealing market share. Taking advantage of the corporate media donut window by promoting the new sandwich, we developed the “What Came First?” promotion to fill the hole. 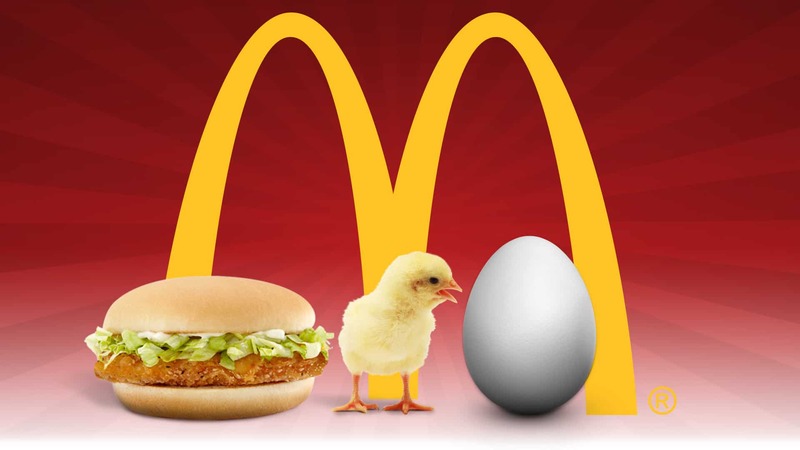 This promotion combined the best selling menu item, the Egg McMuffin, with the new sandwich, the Southern Style Chicken, for a bounce-back promotion targeting brand enthusiasts and converting them to brand advocates, increasing velocity of return visits. During our efforts, customers that visited a restaurant for breakfast would receive a discount if they returned for lunch. Our aim was to to make a two time per week customer into a three time per week customer—a 50% increase! Consumers would be driven, through radio, in-store POP, in-bag and street teams to the “What Came First?” website where they would be exposed to the brand and the promotion in a fun, non-threatening atmosphere. Consumers were encouraged to vote on who they felt came first—the chicken or the egg—and rewarded them for doing so or by helping make the site viral by inviting their friends to participate.